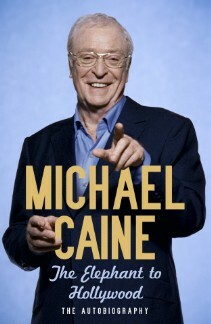 Thanks to the wonderful people at Hodder & Stoughton, we've got SEVEN copies of Sir Michael Caine's new autobiography to give away. "It's been a long journey for Maurice Micklewhite - born with rickets in London's poverty-stricken Elephant & Castle - to the bright lights of Hollywood. With a glittering career spanning more than five decades and starring roles which have earned him two Oscars, a knighthood, and an iconic place in the Hollywood pantheon, the man now known to us as Michael Caine looks back over it all." How To Win: We recently set up a Facebook fan page for the blog. Go there and "like" the page. There will be an entry regarding this blog post - in the comments, tell us your favourite Michael Caine film (and why, if you want to stand a better chance of winning). If you don't have Facebook, do sign up, it only takes a minute. The competition closes on Tuesday 5th October at 3pm, UK time. UK entrants only also, I'm afraid. Also, apologies for messing up the Facebook page link before. It works now, I promise. Purchase 'The Elephant To Hollywood' at Amazon UK or pre-order at Amazon.com.